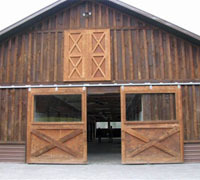 The barn at the new Cabin Creek facility will be home to retired racehorses. Photo courtesy Old Friends. Michael Blowen, founder and president of Old Friends, has announced the opening of his organization’s first satellite facility for retired Thoroughbreds. Cabin Creek, a 40-acre farm just outside Saratoga in Greenfield Center, NY, will begin receiving horses immediately. An official opening and celebration is planned for July 22, 2010. Owned by Joann and Mark Pepper, Cabin Creek features 12 stalls, two round pens, five finished paddocks, and has raw space available for development and growth. The first resident, Moonshadow Gold–a 10-year-old New York-bred gelding acquired through the efforts of several equine-welfare advocates–will arrive later this week. The Peppers, who built Cabin Creek from scratch 15 years ago, will handle day-to-day operations. “When we built the farm my goal was to do Thoroughbred retirement,” said Joann, who began her life with horses as a groom for Nick Zito. “Initially we did boarding and foaling as a way to establish ourselves, but I always came back to the idea of retirement. I had read about Old Friends, and this summer a piece in the Saratogian prompted me to call Michael,” she continued. “I explained that my farm was empty and I wanted to emulate what he was doing. It just clicked that we would do it together. In 2003 former Boston Globe journalist Michael Blowen began building his “field of dreams”–Old Friends, a retirement home for Thoroughbreds no longer capable of racing or breeding. In 2009 the farm has grown to more than 92-acres and is home to 70-plus ex-race horses all deserving of a dignified career end. It is open to the public daily and attracts thousand of tourists and fans to central Kentucky annually. It has long been an objective of the group to launch additional facilities wherever horse racing and breeding are prominent. “This was just an amazing opportunity,” said Blowen, who finalized arrangements with the Peppers just last week. “I have always felt there was a need for Old Friends all over the country. The launch on July 22nd will be open to the public and will feature a memorial to Frankel and his auspicious career. More information will be released closer to the date. For more information about Cabin Creek or Old Friends contact the office at (502) 863-1775 or see their website at www.oldfriendsequine.org. This is really great news! I live probably a half an hour from Saratoga, NY. I should take a day to go see this place. This is good news! It is great how caring these people are. This is great, we need more facilities like this everywhere! this is an amazing creation! too bad other don’t care enough to do this too! hopefully people will read this or visit this farm and be inspired. I love hearing about horse rescues. It just goes to show that horse slaughter isn’t necessary as long as people are willing to try to help the horses in need!